Combo boxes and list boxes are a great way to control user experience by limiting the values that a user can choose to a known list. 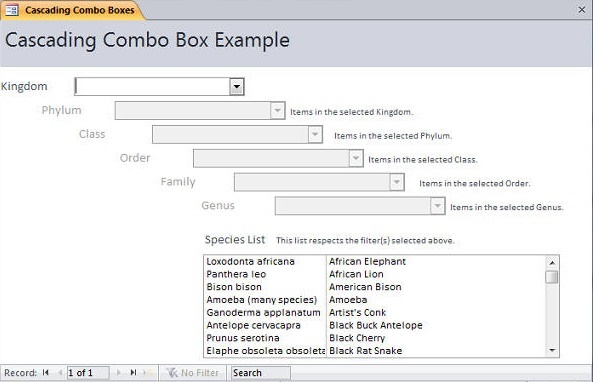 In Microsoft Access, a common need is to have multiple combo boxes or list boxes on a form, and to have the selection in one combo box limit the choices in a second combo box. For example, an Address form containing Country and State lookups. When you select a country, its list of states appear. Our this sample database, we have a list of species, both plants and animals, categorized by their taxonomic rank (kingdom, phylum, class, order, family, genus, then species). If you select the value "Animal" from the Kingdom combo box, the Phylum combo box is updated to show Animal phylums only. The Species list box is also filtered by your selection. 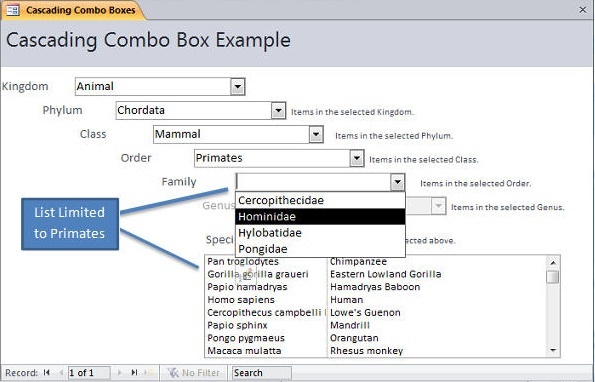 To create the cascading combo box, we add code in the "AfterUpdate" event for the Kingdom combo box, to update the RowSource property of the Phylum combo box based on the selected Kingdom. After updating the RowSource property, use the list box's Requery method to re-load the data in the ListBox. There is sometimes confusion between the terms RecordSource and RowSource. Both are properties that can contain a table, query, or SQL string. The RecordSource property is a form or report property to populate the data that Microsoft Access displays for that object. The RowSource property is at the ComboBox or ListBox control level that tells Microsoft Access what data to display for the control. It is independent of the data specified by the object's RecordSource.